Pretty half-timbered houses, cobbled streets, fantastic food. Troyes is the perfect place to break a journey or stop for a weekend if you’re travelling in France. This past month has taken us on a bit of a French adventure. Living in the UK means that travelling to France by road can be just as easy – if not easier – than flying, and besides which, it had been a while since I’d last been on a proper road trip. So we packed up the car for a jaunt to the continent. As we had a long road ahead of us, it made perfect sense (or rather it was the perfect opportunity) to make the most of our journey and weave in some interesting stops along the way. The curious traveller in me loves pouring over a map and picking out places that sound interesting, which is precisely how we ended up in Troyes. Troyes happened to be the perfect half-way point between our channel crossing and our final destination in the Alps. But it also sounded enticingly interesting. I’d heard that it was beautiful, but a bit of exploring online left me none the wiser when it came to the city’s charms. Rather than letting this put me off, there was only one thing to do – go and find out more. Troyes is a historic town in the heart of France’s Champagne region. It’s a region littered with well-groomed vineyards, perfect sandy-coloured hilltop towns and decadent Champagne houses. But Troyes adds a colourful juxtaposition, with an old town centre full of teetering half-timbered medieval buildings that wobble three and four storeys high in winding little streets packed with cafes, restaurants and shops. The river Seine winds languorously through the town, with colourful flower boxes topping every bridge. It’s undeniably pretty, and a surprising contrast to it’s surroundings. It’s not a huge city, and you can comfortably explore in just a few hours. This makes it a great stop if you’re travelling south to the Alps or the Mediterranean from the UK or northern Europe. It’s also a great base for discovering the surrounding area which includes the Fôret d’Orient national park, home to vast lakes and lush woodland that’s perfect for walking and cycling. 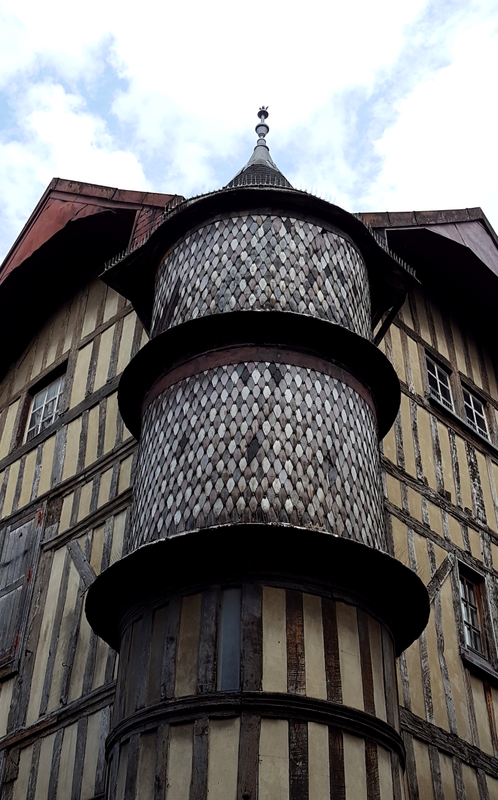 With only a quick overnight stop for us to make the most of, we embarked on a whistle-stop tour (of sorts, invented on the spot) of Troyes’ highlights. 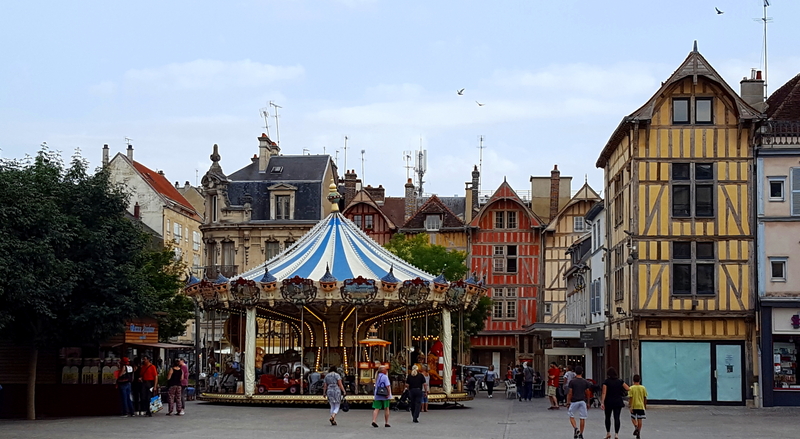 The old centre of Troyes is loosely ringed by the Boulevards Gambetta, Victor Hugo and du 14 Juillet, and by the river Seine as it snakes it’s way through the city. The very centre is largely pedestrianised, and I’d recommended navigating your way to the Place Maréchal Foch to begin your explorations. From here, enticing winding streets disappear off in all directions. Beautiful buildings look down on your from every angle and there’s a vibrant, lively feel with the street-side cafes full, in the early evening, with locals and visitors enjoying a last coffee of the day or a sneaky apertif. 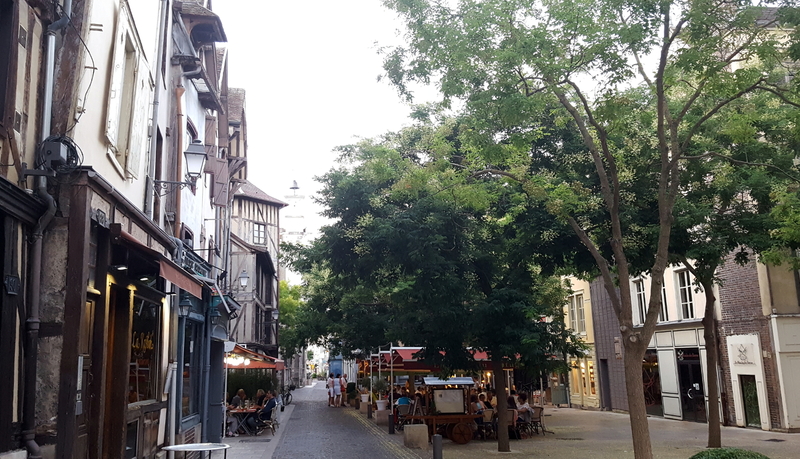 The streets east of Place Maréchal Foch are amongst the prettiest, with ancient buildings and characterful restaurants and cafes woven amongst little squares and upmarket shops. 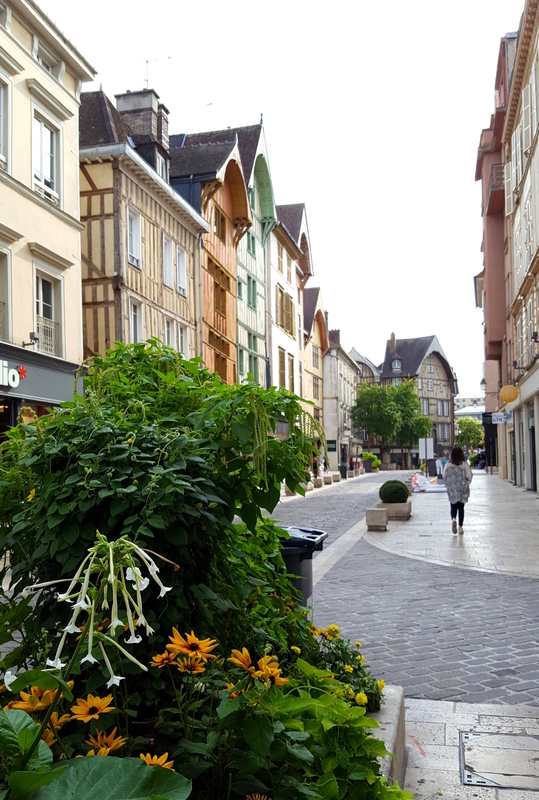 Alongside the Boulevard Gambetta you’ll find the verdant Jardin du Rocher and Jardin de la Vallee Suisse, a pair of pretty parks lush with vegetation in contrast to surrounding buildings. Head west towards the river and you’ll find the delightful Mairie with colourful formal gardens laid out in front of it. Keep going in this direction and you’ll stumble across the monumental Cathedral of St. Pierre and St. Paul – a cluster of stunning gothic churches including the Basilica of St. Urbain as well a some of the city’s oldest university buildings. There was plenty to keep us occupied for a few hours. Troyes in a town that’s best explored slowly, and on foot. There’s great architecture details to be found, an attractive riverside and an abundance of lively cafes in which to soak up the traditional French atmosphere. Much as I could quite happily have spent our short visit munching my way through as many of this city’s establishments as possible, sadly common sense prevailed and instead I’m making one outstanding recommendation. 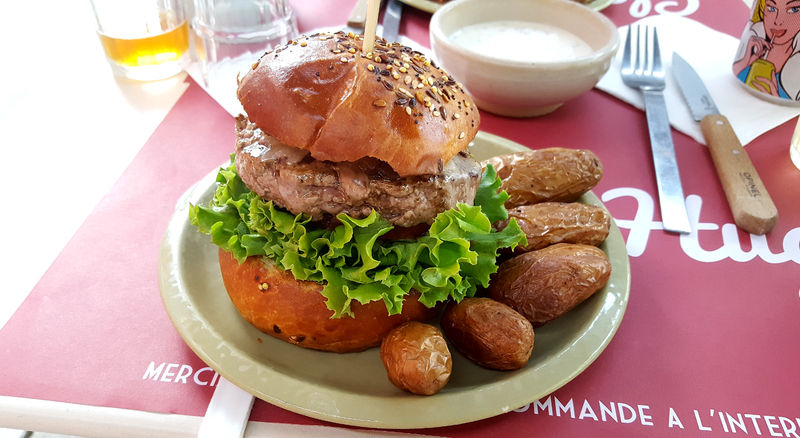 You’ll find plenty of smart-looking looking restaurants around Place Maréchal Foch, Rue Urbain VI and Rue Champeaux. They mostly offer typical French dishes, with appetising menus du jour advertised on chalkboards where the resturant tables spilled onto the street. But we were looking for something a bit more unusual, and a bit of online research had hinted at something exciting. Just before 7pm we headed to Les Halles, the old covered market building close to the town centre. In the square outside was just what we were hoping for – a big, red double-decker bus. Claire & Hugo rolls into town most weeknights, and some lunchtimes (check their Facebook page for more details). 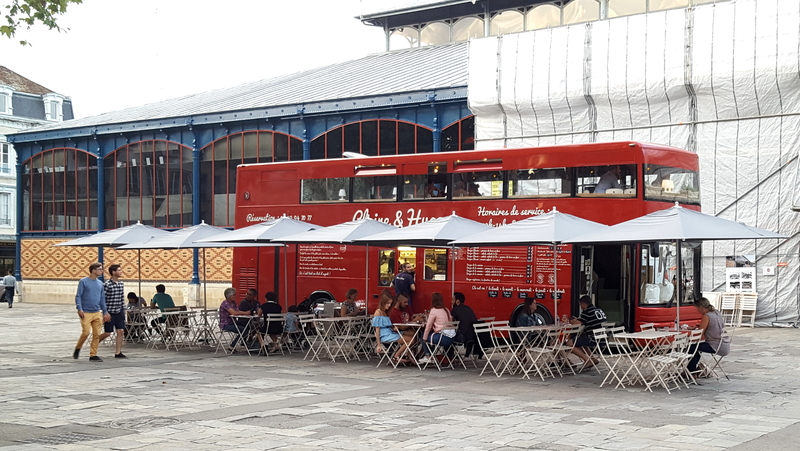 They park up, put up pretty little cafe tables and umbrellas outside and proceed to cook incredible hand-made burgers, desserts, and quite determinedly, no chips. We couldn’t have wished to find anything better. Their menu was genuinely interesting, with fantastic burger toppings (Parmesan on a burger just happens to be the greatest thing I’d never tried before) and delicious side salads that outshone most burger joints I’ve ever visited. No chips meant oven-roasted, local Charlotte potatoes with just a touch of salty butter. Home-made pannacotta with ginger, nectarine, raspberry and mint was an absolute delight. And all this, for less than €30 for the both of us, including drinks. I’d go back to Troyes just to try it all again. We only had a few hours in Troyes before heading off to our Airbnb a few kilometers out of town, and then on towards the Alps. But this delightful little city really charmed me, and felt very French even during the peak of the European summer holiday season. 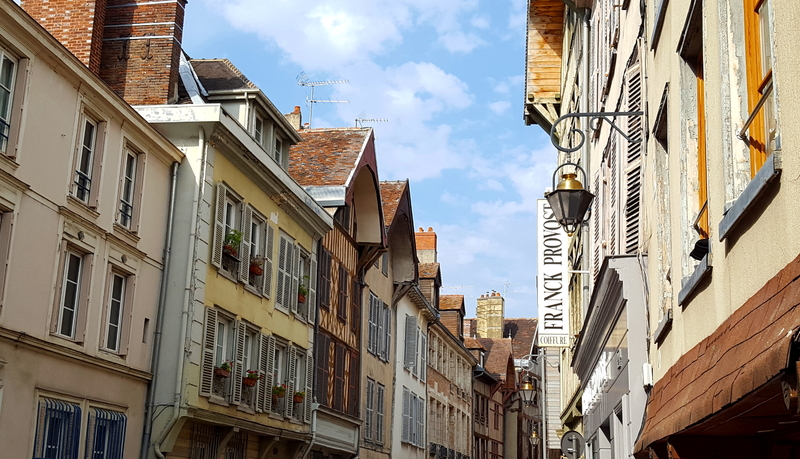 There’s a great feeling when leaving a place you’d be happy to return to again, and would even go out of your way to revisit – and that’s how I felt about Troyes. I’ll be back one day, and I hope to enjoy it just as much. Have you discovered any hidden gems en route to other destinations? I’d love to hear your stories (and borrow some inspiration) below. If you’re travelling by road, as we were, Troyes can be reached from junction 23 of the A26 autoroute. It’s a ten minute drive to the city centre. Parking can be found on Boulevard du 14 Juillet at a rate of about €1 per hour. If you’re heading back to the autoroute, you’ll pass through a commercial centre on the outskirts of town – fill up on supermarket petrol here to save a generous amount compared to motorway service stations. Troyes is also served by high speed rail services from Paris, with direct trains from Gare de l’Est taking as little as an hour and a half. Check out the SNCF website for more details.